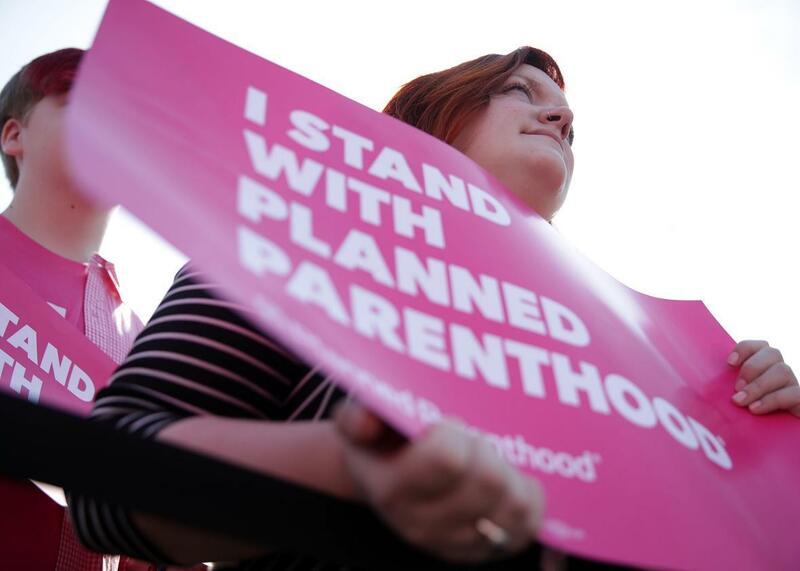 Four Planned Parenthood centers close in Iowa today, thanks to state defunding measure. Activists rally in support of Planned Parenthood on March 1, 2017 on Capitol Hill in Washington, D.C.
Four of Iowa’s Planned Parenthood health centers will close today, a result of a “defunding” measure passed by the state’s legislature and signed by the governor in May, hitting Planned Parenthood with a $2 million loss. The shuttering clinics represent one-third of Planned Parenthood’s presence in the state and served almost 15,000 unique patients over the past three years. The GOP-led Iowa legislature and Republican Gov. Terry Branstad were able to block Medicaid reimbursement for Planned Parenthood by turning down $3 million in free federal Medicaid family-planning funding. Yes, Iowa Republicans decided they’d rather put $3 million of extra pressure on their own state’s budget than let low-income residents on Medicaid use their coverage for birth control, STI screenings, cancer screenings, and other non-abortion care at Planned Parenthood clinics. The clinic closures will hit hard for the women of Iowa, especially those who rely on subsidized health care. Three of the four health centers are in counties where Planned Parenthood currently provides 80 to 96 percent of publicly-funded contraceptive services. Iowa Republicans claim that there will be no interruption in service because other clinics can pick up the slack. This is patently untrue. A recent Guttmacher Institute study found that, without Planned Parenthood, federally qualified health centers in Iowa would need to at least triple their client loads to make up for the drop in care providers. Suffocating the country’s largest and most experienced provider of reproductive health care just to make a political point would leave hundreds of thousands of women without access to care. Iowa legislators have also argued that establishing a new independent family-planning program, which will exclude health centers affiliated with abortion providers, will alleviate any strain on existing publicly-funded providers of contraception. The example of Texas crushes that myth. After the state defunded Planned Parenthood and changed its Medicaid-funded family-planning program to a state-run program, Texas saw enrollment decline, contraceptive use drop across the board, and Medicaid births spike in counties where Planned Parenthood affiliates had once been able to provide care for low-income patients. So it’s no surprise that the Congressional Budget Office has estimated that the U.S. would see thousands of extra unplanned births if Trumpcare passes. The proposed health-care bills in both the Senate and the House would take a policy like Iowa’s and apply it to the entire country, preventing Planned Parenthood clinics from getting reimbursed for Medicaid services for one year. This is a wildly unpopular policy in Iowa, even among Republicans. More than three-quarters of respondents in a February Des Moines Register poll said they supported state funding of Planned Parenthood, up 3 points from the previous year. Sixty-two percent of Republicans and the same proportion of evangelical Christians said the same. A nationwide Quinnipiac poll released this week found that 61 percent of voters oppose cutting federal funding from Planned Parenthood, a number that jumps to 80 percent—including 67 percent of Republicans—when it is explained that no federal funding goes toward abortion care. Why, then, are Republicans hell-bent on passing these defunding provisions? Possibly because Planned Parenthood is a powerful political actor in addition to being a health-care provider (though those two arms are separate under the tax code). By cutting off reimbursements for care provided to patients on Medicaid—more than half of Planned Parenthood’s client base—Republicans believe they can strike a blow to a large pillar in the country’s feminist organizing infrastructure. Keeping essential health care services from women is apparently a small price to pay for that political win.